The Champaner Pavagadh Archaeological Park is an ensemble of ancient Hindu religious, military and agricultural structures that date back to the 16th century. The ensemble consists of temples, water installations, residences etc. The park was built by Mehmud Begda and is an outstanding example of a perfect blend of Hindu and Muslim architecture. The Great Mosque (also referred to as Jami Mosque) was used as a model for mosque construction in India in the years that followed its construction. The architectural style of the complex emanates from inventions of several regional sultanates. Apparently, the Champaner Pavagadh Archaeological Park is divided into two precincts. The first of the precincts is the Royal Enclosure that features fortified buildings with defensive towers and gates. This enclosure housed the palaces, the royal mosque, the gardens, and administrative buildings. Today, it houses modern villages and government offices. Fortunately for the history lovers, most of the precinct is buried and thus yet to be excavated. The Royal Enclosure is linked to the second precinct – Jahanpanah – by a processional way through the city gate. This precinct is also largely unexcavated. It happens to have been the capital of Begharha but was abandoned in the mid-16th century after it was conquered by the Mughal Empire. The city’s landscape has been studied by exposing the road network that includes well-built and paved streets. 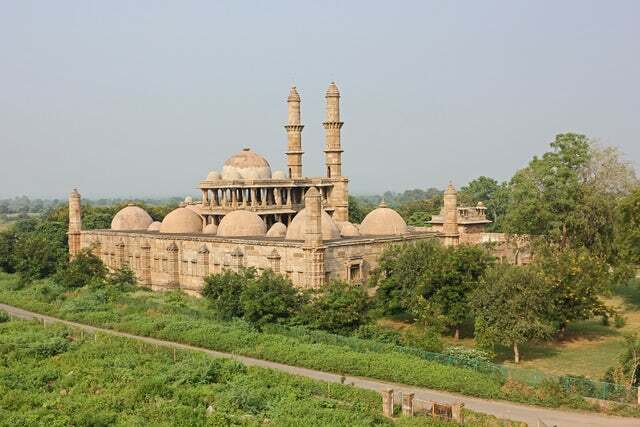 If you want to see the perfect mix of Islam and Hindu architecture, visit Champaner Pavagadh Archaeological Park that today is a huge excavation site. You are likely to see mosques, temples, mausoleums etc. Like all tourist destinations in India, you can expect to spend very little money to get into these sites. It is a cheap destination.